Below is our review of the Acer Aspire V3-571G, a 15.6" laptop, featuring 6GB RAM, 500GB hard drive and Windows 8 64-bit. Next up in our notebook reviews is the V3-571G from the Acer Aspire range - a mid range notebook offering a pretty competitive specification - Intel 2.5GHz processor, 6GB of RAM, a decent size hard drive all running on the new Windows 8 platform, all for under the £500 barrier. 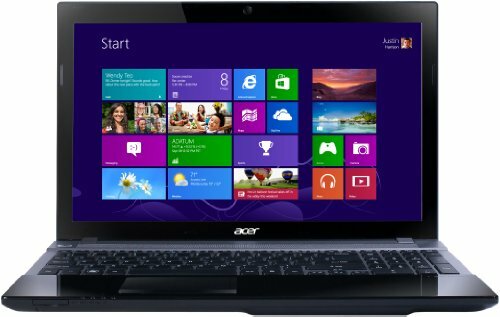 Acer are renowned for producing low priced laptops with decent specifications - often out performing their more established rivals. It may be a less trendy name, but for those who prefer function over form, Acer are worth a look at. In this tradition the latest from Acer's line-up is the V3-571G, a notebook based around the Intel Core i5 3210M 2.5GHz processor, backed up with an impressive 6GB of RAM and 500GB hard drive, as well as the inclusion of the Nvidia GeForce GT 630M graphics card. Multi tasking was handled with ease, and HD videos played back with no issues - overall we were impressed with the specification of this notebook. The 15.6" display features Acer's "CineCrystal LED LCD" technology, and looks and performs great - the picture is clear and the colours crisp and vibrant. Battery life is pretty good for a laptop, offering life of up to 4 hours - so ideal for those who wish to commute. The overall size of the laptop is (in terms of maximum dimensions) 38.2cm by 25.3cm by 3.3cm, and the weight is around 2.6kg, so small enough to travel with for short periods without the notebook being impractical. The exterior of this laptop is accurately described as gloss black - which looks great upon un-boxing - long term use may result in it attracting fingerprints and dust though. The HD webcam is of pretty high quality - excellent for Skype use - and in terms of connectivity you are provided with VGA, HDMI output, Ethernet, USB 3.0, USB 2.0, DVD, a 5 in 1 card reader and headphone and microphone slots. So who is the Acer Aspire V3-571G aimed at? Ideal for home computing, as well as portable enough to be used by students and commuters, the Acer Aspire V3-571G offers great value, and is well worth considering for your next laptop purchase. Pros: Decent specification, relatively low price - offers excellent value. Cons: Gloss finish may not be to everyone's tastes, and may attract fingerprints. A great mid level laptop, competitively priced and ideal for both work and casual use.